English communal leader; born in Hamburg about 1660; died in London about 1730; founder of the Hambro' Synagogue. He was a son of R. Moses ben Löb, one of the founders of the Altona community. He married Fradche, the daughter of Glückel von Hameln, and settled in London at the beginning of the eighteenth century. Having challenged the validity of a divorce granted by R. Uri Phoebus (Aaron Hart) to Ascher Ensel Cohen from his first wife on the ground that the pressure of his creditors compelled him to emigrate to the West Indies, Mordecai was put in "ḥerem." His business was thus brought to a standstill, and his offer of £500 as a guarantee for his future good conduct was refused. Mordecai thereupon opened a synagogue in his own house in Magpye alley, Fen-church street, and engaged as rabbi Jochanan Holleschau, formerly his teacher, who had previously been a member of the London bet din. 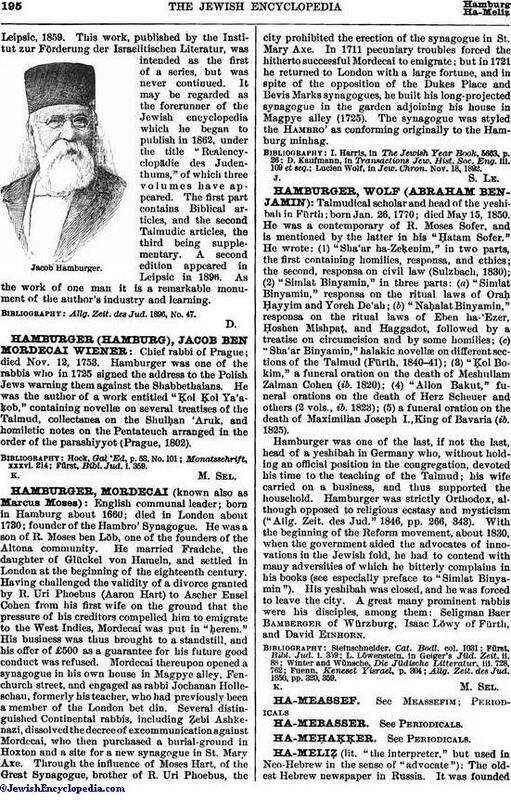 Several distinguished Continental rabbis, including Ẓebi Ashkenazi, dissolved the decree of excommunication against Mordecai, who then purchased a burial-ground in Hoxton and a site for a new synagogue in St. Mary Axe. Through the influence of Moses Hart, of the Great Synagogue, brother of R. Uri Phoebus, the city prohibited the erection of the synagogue in St. Mary Axe. In 1711 pecuniary troubles forced the hitherto successful Mordecai to emigrate; but in 1721 he returned to London with a large fortune, and in spite of the opposition of the Dukes Place and Bevis Marks synagogues, he built his long-projected synagogue in the garden adjoining his house in Magpye alley (1725). The synagogue was styled the Hambro' as conforming originally to the Hamburg minhag. Lucien Wolf, in Jew. Chron. Nov. 18, 1892.